Angela Ward brings a wealth of experience in nonprofit administration and education to her role as Operations Manager at the Museum. Hired as our administrative coordinator in January 2015, Angela is entering her third year working for the Museum, where she oversees finance and human resources. 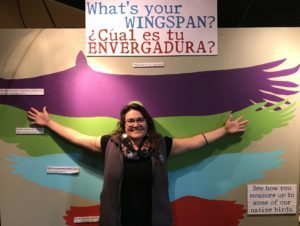 Angela earned a bachelor’s degree in cultural anthropology and linguistics, and later became certified to teach English as a second language. A West Coast native, Angela worked trails in Yosemite National Park and then returned as a backcountry trail cook before taking a job at a one-room elementary school in the park. She later worked for a local health-oriented nonprofit before pursuing a position at the Museum, whose mission was a natural draw. Angela has been impressed by how much the Museum has expanded and fine-tuned its programming and exhibits since she and her son first visited about a dozen years ago. Even though Angela is not directly involved in programming, her experience as a bilingual educator is an asset as new initiatives arise. “I am excited that we are working to expand our reach by improving access to our native Spanish-speaking communities,” Angela said.